Lieutenant Brad McIver, Captain Kris Halliday, Amanda Merrett and Major Brendan Nottle lead a panel discussion during the Social Justice Conference in Melbourne last week. 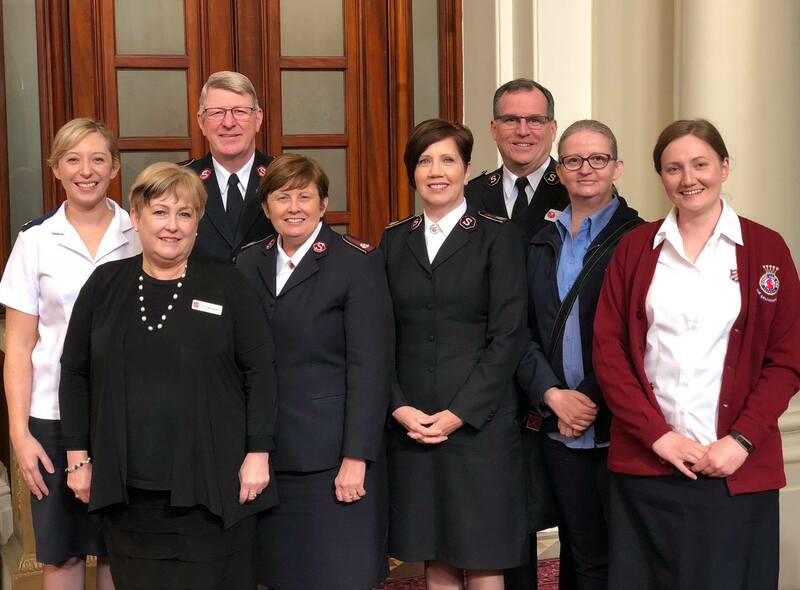 Delegates from The Salvation Army around Australia attended the annual Justice Conference in Melbourne on 26-27 October. The Justice Conference is a vital global platform for the faith and justice community, bringing together world-class speakers and artists into gatherings designed to catalyse emerging works of justice around the world. The Salvation Army is a contributing partner to the Justice Conference through Just Salvos and Social Justice Department based in Sydney. Salvation Army national leaders joined Justice Conference leaders for the annual breakfast. “All Things New” was the theme for this year’s conference, based on Revelation 21:5: “... Behold, I am making all things new”. “In the midst of a fractured and crumbling world, we could be forgiven for following a narrative of failure and hopelessness,” wrote the Justice Conference organisers. 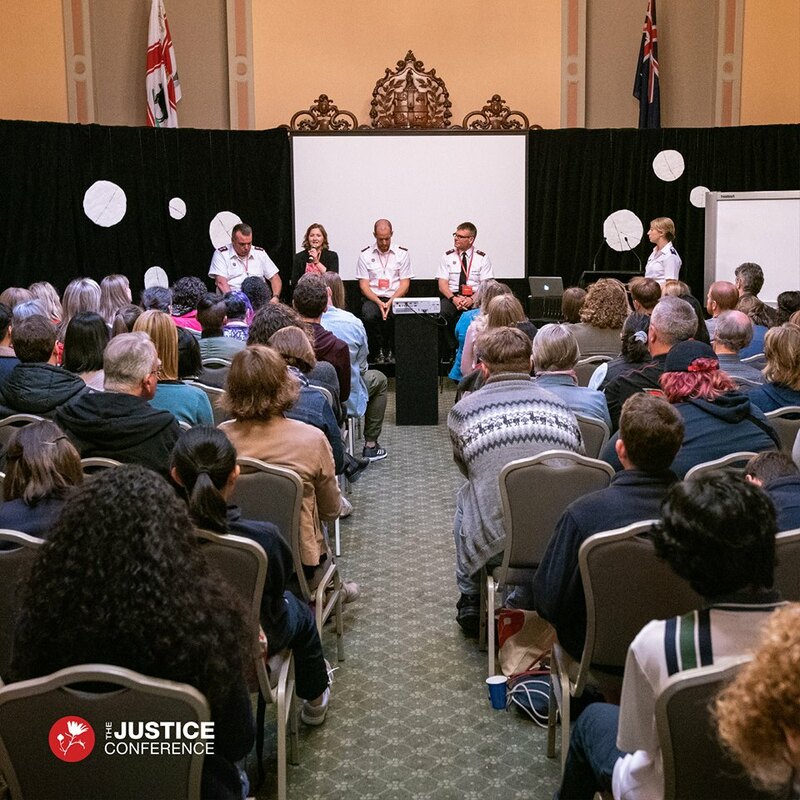 The Salvation Army’s Major Brendan Nottle, Amanda Merrett, Lieutenant Brad McIver and Captain Kris Halliday presented an elective workshop, moderated by Casey, on the first day of the conference entitled “Social Justice as a Lifestyle”. The workshop focused on the invitation to participate in God’s restoring work and that this invitation extends to all, not just the qualified or missionaries. Interested delegates were asked to “Join Salvos engaged in community transformation as well as policy to discuss what it means to seek justice in all the spaces of our lives”, with panel members answering questions focusing on what a lifestyle of justice look like in their workplace, neighbourhood, and even their home. “As Christians, regardless of where we sit in any organisation, in our families, neighbourhoods, or places of work or study – if we’re serious about the Kingdom of God coming to earth and being experienced by our communities, we have to acknowledge that we all have a role to play in every area of our lives, every day,” said Lieutenant McIver, Community Service Operations Manager based in Sydney. Standing room only for The Salvation Army workshop. Amanda, Assistant to the Social Justice Secretary based in Melbourne, shared her experience of being part of the Justice Conference. “People like to hear about the work of the Salvos because we jump right into the hard places and commit to journeying alongside communities as they experience hardship and injustice; I think it is a privilege to share our knowledge and experiences in a way that empowers people to do the same,” she said. “And that’s what we wanted to do – give people practical suggestions on how they could make social justice a part of their lifestyle in all its different aspects. Salvation Army delegates to the conference, including two cadets, employees, volunteers and those interested in social justice, also staffed the Salvos stand during the conference expo.